Normally, the maxillary cuspid teeth are the last of the “front” teeth to erupt into place. They usually come into place around age 11-12 and cause any space left between the upper front teeth to close tighter together. 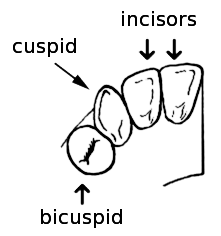 If a cuspid tooth gets impacted, every effort is made to get it to erupt into its proper position in the dental arch. The techniques involved to aid eruption can be applied to any impacted tooth in the upper or lower jaw, but most commonly they are applied to the maxillary cuspid (upper eye) teeth. Sixty percent of these impacted eyeteeth are located on the palatal (roof of the mouth) side of the dental arch. The remaining impacted eyeteeth are found in the middle of the supporting bone, but are stuck in an elevated position above the roots of the adjacent teeth, or are out to the facial side of the dental arch. The older the patient the more likely an impacted eyetooth will not erupt by natural forces alone, even if the space is available for the tooth to fit in the dental arch. The American Association of Orthodontists recommends that a panoramic x-ray – along with a dental examination – be performed on all dental patients at the age of seven to count the teeth and determine if there are problems with eruption of the adult teeth. It is important to determine whether all the adult teeth are present or if some adult teeth missing. This exam is usually performed by your general dentist or hygienist who will refer you to an orthodontist if a problem is identified. Treating such a problem may involve an orthodontist placing braces to open spaces allowing for proper eruption of the adult teeth. Treatment may also require referral to an oral surgeon for extraction of over-retained baby teeth and/or selected adult teeth that are blocking the eruption of the critically-important eyeteeth. The oral surgeon will also need to remove any extra teeth (supernumerary teeth) or growths that are blocking the eruption of any adult teeth. If the eruption path is cleared and the space is opened up by age 11-12, there is a good chance that the impacted eyetooth will erupt with nature’s help. If the eyetooth is allowed to develop too much under the surface (by age 13-14), the impacted eyetooth will not erupt by itself, even with the space cleared for its eruption. If the patient is older (over 40), there is a much higher chance that the tooth will be fused in position. In these cases, the tooth will not budge despite all the efforts of the orthodontist and oral surgeon to erupt it into place. Sadly, the only option at this point is to extract the impacted tooth and consider an alternate treatment to replace it in the dental arch (some common options are the placement of a crown on a dental implant or the installment of a fixed bridge). Shortly after surgery (1-14 days) the patient will return to the orthodontist. A rubber band will be attached to the chain to put a light eruptive pulling force on the impacted tooth. 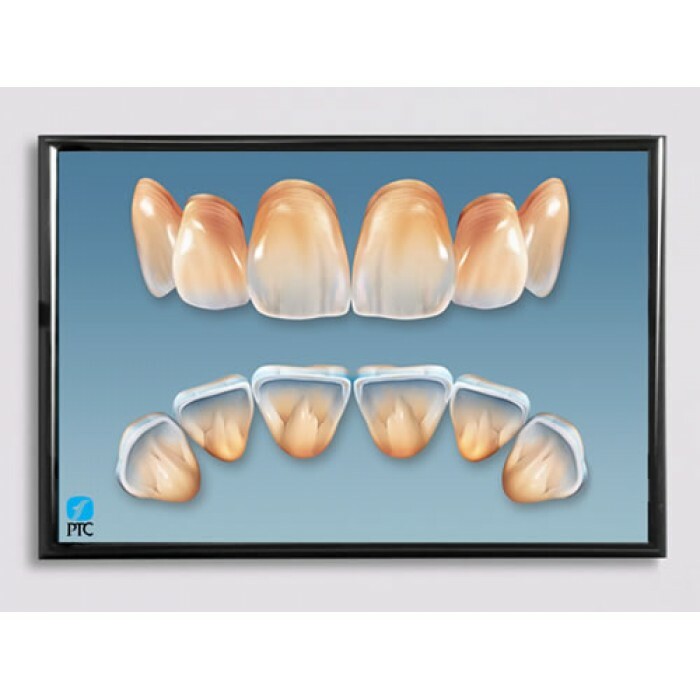 This will begin the process of moving the tooth into its proper place in the dental arch. This is a carefully controlled, slow process that may take up to a full year to complete. 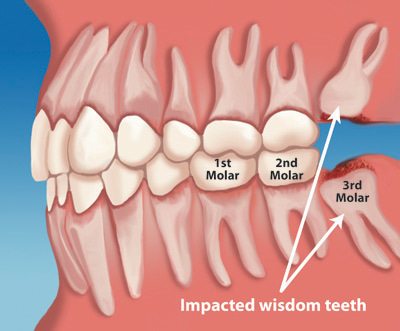 Remember, the goal is to erupt the impacted tooth and not to extract it. Once the tooth has moved into the arch in its final position, the gum around it will be evaluated to make sure it is sufficiently strong and healthy to last for a lifetime of chewing and tooth brushing. In some circumstances, especially those where the tooth had to be moved a long distance, there may be some minor “gum surgery” required to add bulk to the gum tissue over the relocated tooth so that it remains vigorous during normal function. Your dentist or orthodontist will explain this procedure to you if it applies to your specific situation. Recent studies have revealed that with early identification of impacted eyeteeth (or any other impacted tooth other than the wisdom teeth), treatment should be initiated at a younger age. Once the general dentist or hygienist identifies a potential eruption problem, the patient should be referred to the orthodontist for early evaluation. In some cases the patient will be sent to the oral surgeon before braces are even applied to the teeth. As mentioned earlier, the surgeon will be asked to remove over-retained baby teeth and/or selected adult teeth. He will also remove any extra teeth or growths that are blocking the eruption of the developing adult teeth. Finally, he may be alternatively be asked to simply expose an impacted eyetooth without attaching a bracket and chain to it. In reality, this is an easier surgical procedure to perform than having to expose and bracket the impacted tooth. This will encourage some eruption to occur before the tooth becomes totally impacted (stuck). By the time the patient is at the proper age for the orthodontist to apply braces to the dental arch, the eyetooth will have erupted enough so that the orthodontist can bond a bracket to it and move it into place without needing to force its eruption. This saves time for the patient and means less time in braces (always a plus for any patient!). The surgery to expose and bracket an impacted tooth is a very straightforward surgical procedure that is performed in the oral surgeon’s office. For most patients, it is performed using IV sedation. In selected cases it will be performed under laughing gas and local anesthesia. The procedure is typically scheduled to take approximately 45-60 minutes. If the procedure only requires exposing the tooth with no bracketing, the time required will be shortened by about one half. You can expect a limited amount of bleeding from the surgical sites after surgery. Although there will be some discomfort after surgery at the surgical sites, most patients find Tylenol or Advil to be more than adequate to manage any pain they may have. Within two to three days after surgery there is usually little need for any medication at all. There may be some swelling: it can be minimized by applying ice packs to the lip for the afternoon after surgery. A soft, bland diet is recommended at first, but you may resume your normal diet as soon as you feel comfortable chewing. It is advised that you avoid sharp food items, like crackers and chips, as they will irritate the surgical site if they jab the wound during initial healing. You should plan to see your orthodontist within 1-14 days to activate the eruption process (during which he or she will apply the proper rubber band to the chain on your tooth). As always, your doctor – Dr. Stegmann – is available at the office and can be contacted after hours if any problems should arise after surgery. Simply call Lakeside Oral Surgery & Dental Implant Center at Lakeside Oral Surgery Phone Number 231-947-4141 if you have any questions.